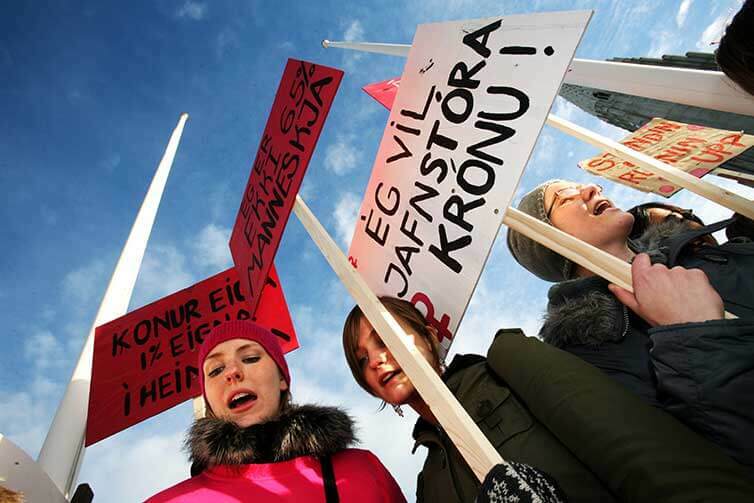 A bill moving through the Icelandic parliament would require public and private firms to prove they offer equal pay regardless of gender, ethnicity, sexuality or nationality. If passed, the law would come into effect next year, marking the first time a national regime has been introduced for mandatory equal pay in both sectors. Companies and institutions with over 25 employees would need to obtain a certificate of compliance with the rules, a process which involves classifying each position and reducing any wage gaps to less than five per cent. Firms would also be subject to audits to ensure continued compliance, with all entities certified by 2022. Any entity failing to take adequate steps would be subject to a series of escalating fines. Introduced by the country’s centre-right governing coalition and supported by several opposition parties, the bill forms the centrepiece of the government’s plan to entirely eliminate the Icelandic gender gap by 2022. The country has been ranked the most equal country under the World Economic Forum’s Global Gender Gap Index for the past eight years, but government statistics show that women still earn on average 17 per cent less than men. Both direct and indirect forms of pay discrimination are factors in the wage gap, according to the Icelandic government, but pale in comparison to other factors such as continued gender dominance in specific sectors, a lack of women in senior leadership and the outsized role women play as primary caregivers. Iceland has taken steps towards addressing this gap such as introducing corporate board quotas and generous parental leave policies, but Thorsteinn Viglundsson, Iceland’s equality and social affairs minister, believes more aggressive action is needed to reach 100 per cent. “The gender pay gap is unfortunately a fact in the Icelandic labour market and it’s time take radical measures; we have the knowledge and the processes to eliminate it,” Viglundsson said in an interview with The Guardian. He acknowledged that compliance would be a burden on public and private entities alike, but that the obvious company-wide and societal benefits were too important to ignore. The legislation is modelled after an equal pay pilot program begun in 2013.
Business groups like the Confederation of Icelandic Employers have spoken up against the bill, but a recent poll conducted by Market and Media Research found only 20 per cent of the population against the effort. The groups most in favour were 18 to 29-year-olds and women in general, as well as a surprising level of support among older voters over 68. Voters for the right-leaning populist Progressive Party and wealthier voters were the most opposed.